Welcome to our review of the Vanguard Endeavor HD 82mm Angled Eyepiece Spotting Scope. Vanguard makes some fantastic glass, and I was thrilled to get my hands on this spotting scope to test it out. It is definitely a distinctive-looking spotting scope, and boasts a very large 82mm objective lens. Let’s have a look at its features and how well it performs in the field. The deluxe carrying bag is very nice, and offers a bit of padding to provide extra protection to your spotting scope. It features a shoulder strap that could use a bit more padding, in my opinion, but is otherwise an excellent accessory. The carrying case features tethered covers for the objective lens and eyepiece, so you can use the spotting scope even with the case on. The 82mm objective lens on the Vanguard Endeavor Spotting Scope provides you with magnification from 20X to 60X, bringing the wildlife straight to you. 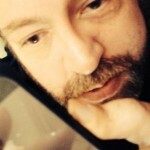 Image quality is fantastic, with excellent crispness and vibrant colors. The eye relief on the Vanguard Endeavor is 19mm to 20mm, and the field of view ranges from 170 feet at 1,000 yards with 60X magnification out to as much as 360 feet at 1,000 yards at 20X magnification. How Easy is the Vanguard Endeavor HD 82mm Spotting Scope to Use? The Vanguard Endeavor is very easy to use, with plenty of knurling on the magnification wheel and focus knobs to make the controls a cinch to operate, with or without gloves. The angled eyepiece (see our article on angled vs. straight spotting scopes) is my favorite design for a spotting scope, since it allows for easy viewing of birds in the trees without craning my neck. How Well Does the Vanguard Endeavor Spotting Scope Gather Light? The Vanguard Endeavor HD 82mm Spotting Scope has fully multi-coated optics, which provides optimum light transmission. The 82mm objective lens brings in a lot of light, making this spotting scope one of the best I’ve seen in terms of light transmission. I’ve used this spotting scope to look for deer in the early morning and late evening hours, and it has helped me to find bucks and does that other spotting scopes wouldn’t pick out. I’ve also used the Vanguard Endeavor HD 82mm Angled Eyepiece Spotting Scope for some lightweight astronomical viewing, and it worked perfectly. What are the Optics and Focus Like on This Spotting Scope? This spotting scope features a roof prism design with BaK–4 prism glass. The prisms have also had phase correction coatings added to them, designed to correct the “phase shift” that normally occurs when light is reflected around the prism. As a result, you get an image with excellent color reproduction, resolution, and contrast. The lenses are made of extra low dispersion glass, which prevents color dispersion from washing out or color-fringing your image. Focus is achieved using dual controls, one for coarse adjustment and one for fine adjustment. Both focus knobs are centrally located, and have lots of knurling for ease of turning with sweaty or gloved hands. The focus and magnification wheels turn smoothly, but with enough resistance to keep you from accidentally shifting your focus or magnification when you don’t want to. The main chassis of the Vanguard Endeavor is made from a magnesium alloy, which provides plenty of durability while keeping the unit lightweight and solid. The controls are perfectly placed central to the eyepiece, and the body has plenty of rubber armor to protect it and help you grip it. On top of that, the metal finish that is exposed has a fine texture to it, to help even more with grip. The spotting scope features a retractable sunshade for use in bright sunlight, a tripod shoe, and the eyepiece is removable. You can even get a digiscoping adapter for the Endeavor HD for use with your SLR or digital SLR camera. How Durable is the Vanguard Endeavor Spotting Scope? The Vanguard Endeavor HD 82mm Spotting Scope is shock-resistant, because of its rubber armor, and it is both waterproof and fogproof. The information on the spotting scope does not say how deep or for how long the glass will remain waterproof, but I’ve dunked mine in the bathtub a few times to wash off grime without any problems. 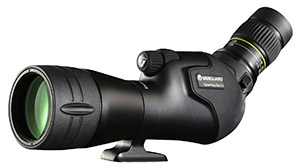 Thanks for reading this review of the Vanguard Endeavor HD 82mm Angled Eyepiece Spotting Scope. While this is definitely a more expensive spotting scope than many alternatives, it is superior to the competition in many ways. The light transmission is among the best I’ve seen, and the clarity and contrast of the image is fantastic.